Because a towball rack is solidly mounted to your car, there's almost no chance of it coming off as you drive. With multiple attachment points for the bikes themselves, they're very securely attached and being behind the car they can't get damaged because you forget they're there and drive into a low-roofed garage. All that makes a towball rack the safest way to transport a bike. The Thule VeloCompact 925 is fully assembled out of the box and fitting it to the car is a really simple operation; you don't even need to read the instruction manual. Simply position the rack over the towball and push the large lever down, then turn the key to lock the rack inplace. The tension of the locking arm can be adjusted, but once set you never need to do it again. The trickiest bit of this operation is lifting the rack up to the towball, because at 14.3kg, it's not exactly light. Fitting a bike to the rack is equally simple, and shows Thule has really thought carefully through the entire process. Moulded wheel supports slide out of the rack and wide plastic ratchet straps clamp the wheels into place. The straps are generous enough to take very wide tyres. I fitted a 3in mountain bike tyre, so the widest road/adventure bike tyre is absolutely no problem. Two metal arms extend from the top of the frame and end in soft-jawed clamps that grab your bike's frame, either around the top tube or down tube. The arms can easily be repositioned wherever you need them. You use the short arm for the bike closest to the car, and the long arm for the bike on the outside of the rack. Fitting one bike is easy, and once you know the best way to position a bike, it takes all of 30 seconds to have a bike clamped down onto the rack. Fitting two bikes occasionally requires some Krypton Factor level mental agility to figure out which one best goes where and how to clamp them, but if you take your time it's straightforward to get two bikes nicely secured into place on the rack. I never had any problems with a wide range of bikes, even pairing a mountain and road bike together. The arms have rubber coated clamps to protect the paintwork of your pride and joy, and the large knurled plastic dials are quick to adjust. They can be locked to deter theft, but if you're planning to leave the bikes on the rack and out of sight for a significant amount of time, I would invest in a very long cable lock to secure the bikes to the car somehow. Or not leave the car unattended; it's just not worth the risk. Thule packs some useful features into this rack. There's a slot for the car number plate with plastic clips that hold it in place, which means you can easily change the number plate if swapping between different cars. Indicator and brake light pods slide out when in use, and slide away to make the rack more compact when in storage. The lights are powered by a regular seven-pin plug. I've been using this rack for the past few months, with all manner of bikes, from road race to adventure and gravel bikes, as well as mountain bikes. I've not come across a combination that causes any problems yet; even a plus sized mountain bike and a road race bike sit happily alongside each other on the rack. The rubber coated grippers haven't damaged any bikes, but I have used rags to protect the paintwork on some road bikes, just to be on the safe side. I've used carbon road bikes without any issues. You don't need to do the clamps very tightly around the frame tubes, so go easy on the torque. Driving shows the rack to be extremely secure and very stable. It does wobble a small amount but it's not excessive. There's no wind noise and depending on the bikes fitted to the rack, there's little impact on the fuel economy or driving characteristics through the bends. If your car has parking sensors they are set off by the rack, but reverse parking with two bikes on the rack is easy because the bikes provide a useful visual indication. If you need to access the car boot without wanting to remove the bikes, the Thule VeloCompact 925 shows its best feature: a foot switch that allows the entire rack to lean forward far enough from the car that you open the boot or hatch. It's an ingenious solution and works brilliantly. It's a key feature over the cheaper Thule EuroRide and worth paying the extra for, especially for road trips where easy access to the boot is so valuable. There is a bike weight limit of 25kg which might preclude some e-bikes but regular mountain and road bikes should be just fine inside this limit. If you need to transport three bikes, the VeloCompact 927 (£425) has an extra bike rack. It's not a cheap way of carrying bikes compared to a strap-on boot rack or even roof rack, but it's the most secure, stable and convenient for regular and longer trips. And you have to factor in the cost of the towbar as well, which on my car cost a couple of hundred quid. However, if you're regularly loading up your car with a bike or bikes, the investment quickly pays off with the sheer ease of use it offers over most other racks. Please do not clamp such expensive carbon bikes by the frame. There is a cheap adapter https://www.thule.com/en-gb/gb/bike-rack/accessories/thule-bike-frame-ad... that can be used to safely transport carbon (or any other delicate) bikes. I have the 3 bike version of this, with the extra extension to let you carry 4 bikes, and I concur: it's a fabulous rack. Much much easier than carrying bikes on the roof like I used to do, and with virtually no penalty on fuel. I disagree with the suggestion above regarding carrying carbon bikes - I couldn't work out how to fit that adaptor on my frame - looks like it will only work with steeply sloping top tubes and a tall head tube. 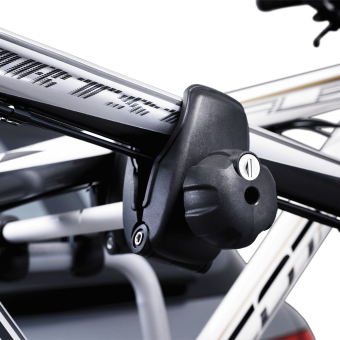 Thule also sell a torque limiting clamp and a flexible pad to use for carbon frames. I have them, but I'm not convinced the torque limiter works. Either that or it's set to far higher a torque than I'd risk on a carbon frame. As the article says, you don't really need to do the clamps up that tightly to hold the bikes securely, as they're not taking any weight. The pad thing is supposed to spread the load of the clamp rather than just a few hot spots where the clamp touches - I use it, no idea if it makes a difference or if it's any better than just using a few rags. There are cheaper racks around, but if you want something that is super quick to throw on and off (I use mine two to three times a week); easy to fold up and store in the boot or garage; quick, easy and safe to load bikes on; easy access to the boot - then it's fabulous. Oh, and I echo the comments on security. As a quick deterrent to stop someone easily removing the bikes, the locks ok. A determined thief would have no trouble removing a bike though. If ours are parked for any length of time, I use a heavy duty chain and lock to lock them to themselves and the rack. Adaptor is suggested by Thule for use with sensitive carbon frames - look at the linked page. It fits very easy - I put it below the stem (around the fork crown) and around the seat tube, and just tighten to fit securely. Clamping force is not a problem, vibrations are. Bikes on these rack vibrate pretty significantly during the ride (due to air flow and winds), so I think that the frame is subjeced to forces not planned for. It is really not a problem to use the adapter and the frame stays safe. BTW, my MTB carbon frame has "do not clamp" marking on the top tube. Also, I would like to mention that the space between the bikes on the stand is pretty limited, so additional care is needed to properly put two or three bikes on it - I usually adjust pedal position and lower the seat so that it does not touch other frame bars. Locking mechanism looks the same as on my Thule EuroRide 940 which, when locked, I can open without any tools. I lost key once and it took me about 10 min to figure out how to do it. So, do not leave bike unattended for long time on this carrier. P.S. I do not posses any specific skills for lock compromising.